Anyone remember Song of Norway? My dad was on it in '77. yes I remember it. This was the shipped that got me hooked on cruising. Back in the day where your every purchased was hand written. Imagine that today with has many passengers that are on board. I was 14 then and had the time of my life. I still have an address book of all the teens on board all I believe 16 of us. lol. My how times have changed. I believe we could put Song of Norway on the H20 zone of Freedom of the Seas. Wow.... My first cruise was on Sun Viking in 1983...! That got me hooked. We boarded in Barbados for a northbound Southern Caribbean cruise to Miami. What a thrill to see that huge (18,000 ton) ship. At the time, I thought she was huge...!! Here is some info on her and the Song of Norway... 19 cruises since then and I ain't stoppin' !! Sun Viking was the last of three similar ships built for Royal Caribbean, being delivered from Helsinki builders Wartsila in 1972. She was 18455 tons as built, and differed from her two predecessors in that the bow was one deck higher, allowing a few additional cabins. Unlike her "sisters", she was not lengthened. She initially operated on 7 and 14-day cruise out of Miami, but later served throughout the world, breaking new territories for RCCL, when superseded by larger ships in the Caribbean. She was sold to Hyundai, becoming their Hyundai Pongnae. 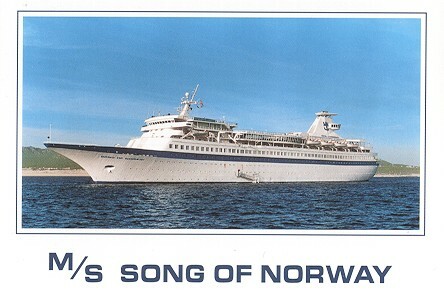 Song of Norway was the first ship built for Royal Caribbean, being delivered from Helsinki builders Wartsila in 1970. She was 18000 tons as built, and carried 724 passengers. In 1978, she was lengthened by 85 feet, to carry a total of 1024 passengers and increase size to 23000 gross tons. She initially operated on 7 and 14-day cruise out of Miami, but later served throughout the world, breaking new territories for RCCL, when superseded by larger ships in the Caribbean. She was sold to Sun Cruises in 1996, becoming their Sundream. The distinctive sky lounge on the funnel was removed as part of the deal, greatly improving her appearance. In 2005, she became the Dream Princess of Caspi Cruises. Our first cruise was on the Song of Norway. We liked it so much that we went back the following year. After that we were hooked on cruising. I think we have been on 18 cruises total but the SoN still has a warm spot in my heart.